A game of interpretation and imagination. PLAYERS: At least 3 players. Best to have several people in the room to enjoy the stories. SUGGESTED AGES: 9 and up. Two MBUDYE (interpreters) compete to tell the most creative story using the pieces laid out by the MULOPWE (the king). 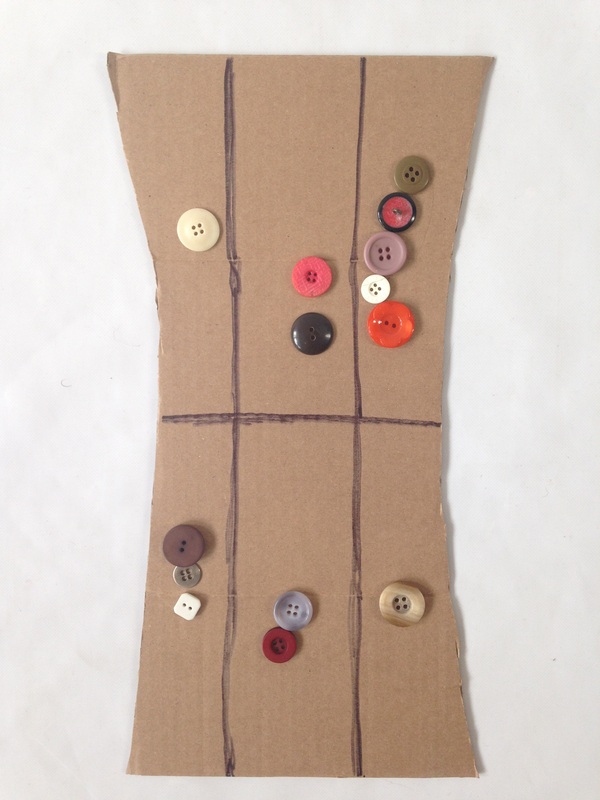 The board for your Lukasa Memory Board Game can be very simple. 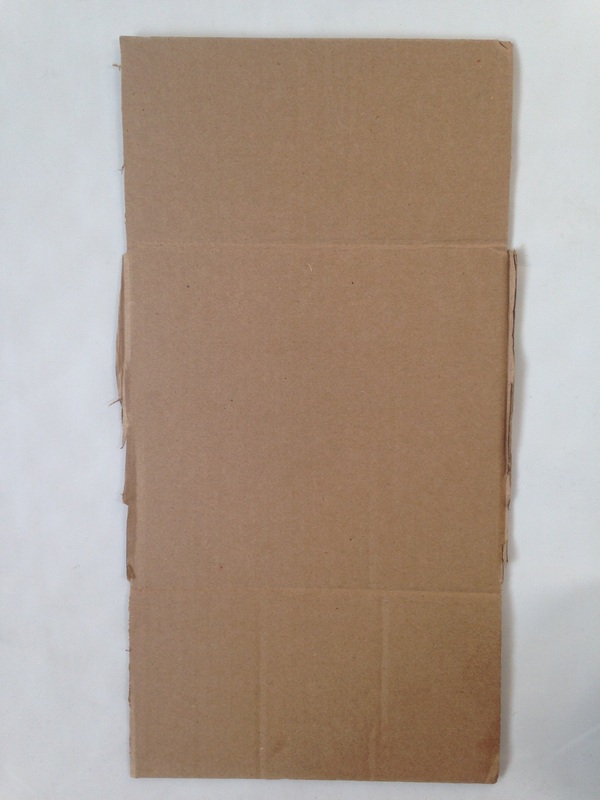 A rectangular piece of cardboard, about 7″ x 15″ (real lukasa memory boards are a bit smaller, about 5″ x 8″) — cut from a box would be ideal. You can also use any rectangular mat, folder or sheet of paper. 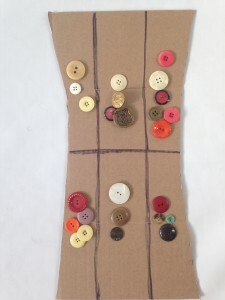 A traditional lukasa memory board is not rectangular, but shaped slightly like an hourglass. If you want to want to get fancy, cut your board into the shape of an hourglass. 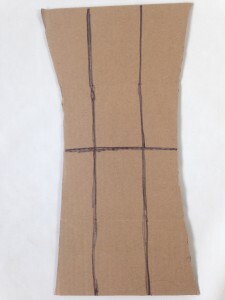 Draw a line across the middle to represent the LUKALA, a row of raised mounds on sent on most memory boards. 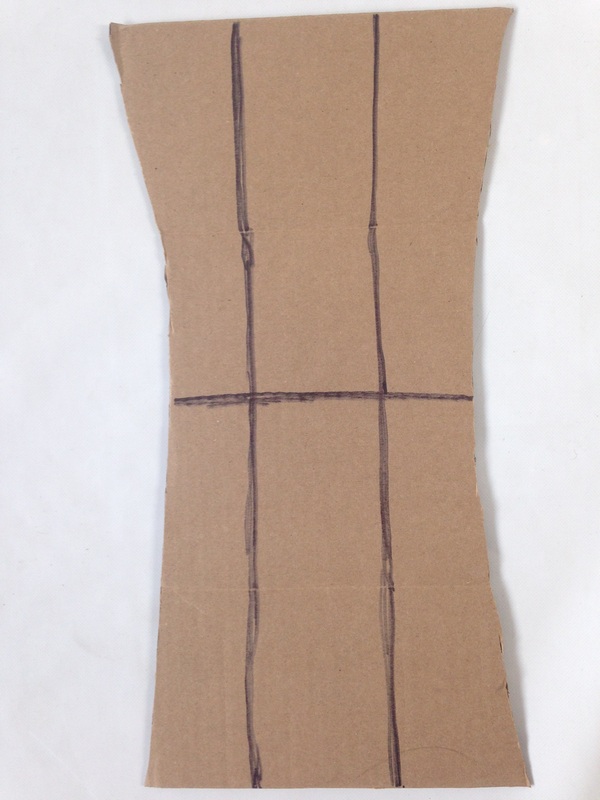 Divide your board into six sections, three on the top, three on the bottom. 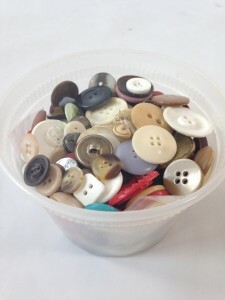 You can use any little things you find around the house for the game pieces The Luba used colorful beads and shells for their memory boards so default to those, but you may also use buttons, coins or even small pieces of paper. You need at least 30 beads or game pieces – they don’t all have to be the same. Two players in each round will be MBUDYE. The third will be the MULOPWE (king). The MULOPWE lays out the pieces on the memory board. The MULOPWE chooses how many pieces to put into each section. ONE => A HERO or HEROINE – In Luba lore, the hero is usually Mbidi Kiluwe, “culture-bearer of kingship,” though your hero or heroine can be anyone. Your hero or heroine can be any age. TWO => AN ANTI-HERO – The villain is often the evil Nkongolo Mwamba, but in your story can be anyone. The MULOPWE reveals the board. The MULOPWE chooses which MBUDYE will go first. That MUBUDYE “interprets the board” by telling a story based on the pieces, lasting no longer than three minutes. (That’s why you need the timer.) The MUBDYE uses the three characters the MULOPWE has chosen – the pieces in the top sections of the board — and the chronological plot points the MULOPE has laid out in the bottom three sections. The second MULOPWE interprets the same board, telling his or her own story within the same time frame using the same characters and chronology, attempting to be more creative than the first. The MULOPWE decides which MUBUDYE told the best story. (The crowd can help with cheers.) The MULOPWE resets the board and starts the next round. The first MUBUDYE to best the other in two of three rounds wins and gets to be the MULOPWE. The story: Roscoe, our HERO, hails from a small town in northern Maine. He learns how to play ping pong in his family’s farm shed from his grandfather, known as Good-Tempered Lou, a former international champion who was defeated by Evil international ping pong star known as Dastardly Dave, our ANTI-HERO. Roscoe falls in love the game, practices with grandpa from the wee hours of morning until late at night, and eventually lands a full ping pong scholarship to Harvard. He takes a JOURNEY to Boston to go to school, hustling ping pong at night to pay for his room and board. One night Crafty Pete, grandson of Dastardly Dave, comes to town. He and Roscoe have a chance meeting at a Red Sox game – of course Crafty Pete, our SERPENT, is a die-hard Yankees fan – and they end up playing a BATTLE Royale using the best ping pong table in town, in the Tufts Student Union. Of course Roscoe wins – a VICTORY for all in the world that is good and true – and Crafty Pete returns to New York, a defeated man. He retires from professional ping-pong, hits rock bottom by starring in a reality show on ESPN 4 about retired professional ping-pong players who have hit rock bottom, and eventually goes on to start a billion dollar hedge fund. Story: Harrison, a bold and powerful substitute teacher (BUFFALO), arrives at The University of Luba to administer the final exam for American History professor, Dr. Henry, who couldn’t teach that morning because she grew a third arm out of her forehead and was at home waiting for an arm-removal service so she could have it removed. (ABSURD!) Sitting in the front row of class is old and wise Mary, our TORTOISE, a 93 year-old great-grandmother who had never finished college because of her marriage at the age of 18 but who had returned when she was 90 to get a degree – A GREAT JOURNEY. Harrison monitors the test, which Mary aces because she’s intimately familiar with a whole lot of recent history, but UNEXPECTEDLY, he mixes up her test booklet with that of a college student who only knows history if it was the subject of a show on the History Channel. (Our CROCODILE. He would have aced the sections on Hitler.) Mary fails the test but, having learned a trick or two among the young upstats (70 year-olds) at her elder living community, hacks into the school’s mainframe, changes her grade to an A, and graduates with honors.